Laura Pizzano used a defribrillator and CPR to save Piero Caserta after he collapsed at a Zydeco night dance party in New Orleans. Little by little, this will happen. The border collie next door breaking into a run, swooping that little dog to safety. It's worth another look. Everybody's reported to be okay. Finally tonight, dancing at the right place, at the right time. It's "America strong." 74-year-old piero caserta knows how to let loose. I like to talk but I like to dance more than I talk. Reporter: Piero, a deacon in the archdiocese of New Orleans, has been a regular at zydeco night at rock 'N' bowl for the last ten years. Piero says it's something about the blend of creole and blues that brings him back week after week. I was kicking up my heels to a song from way back in the '60s. Reporter: But on this particular night, piero started to feel strange. I fell forward initially and then I just collapsed. Reporter: Piero was in cardiac arrest, and in dire need of help. Laura Pizzano, a cardiac nurse from New Jersey and first-timer at rock 'N' bowl, immediately jumped into action. I went over, I saw he wasn't breathing. Reporter: Piero's heart had stopped. Laura knew she needed to act fast. So she reached for the defibrillator the business had installed just months before. So we ended up shocking him. And then we resumed cpr and continued until we got a pulse back. Reporter: Piero was breathing by the time the ambulance arrived, then rushed to the hospital for a successful surgery. It was Laura's quick thinking, and that aed machine, that doctors say likely saved piero's life. Piero says he'll be back out in a few months dancing. Thanks for watching. Have a great evening. Good night. 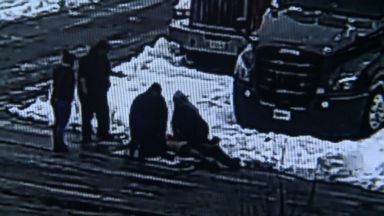 Security camera captures the moment the woman performs CPR on a man having a heart attack at a truck stop. 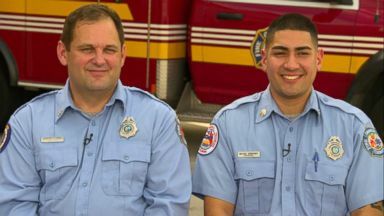 The first responders say CPR saved the life of a toddler, who was found unresponsive without a pulse in the family pool on Christmas Day.